NEWS for Pandeiristas! Brandnew: 'The Complete Pandeiro Guide' by Matthias Haffner now available as instant download or USB stick! 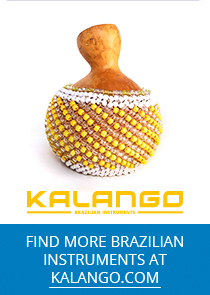 Large variety of Brazilian and Carribean styles from Samba Reggae to Candomblé and from Choro to Funk. Download course for pandeiro players who want to expand technically, broaden their repertoire, strengthen their musical independent and understand music on a different level. A unique course for pandeiristas, drummers and percussionists.